'Razor blades, little pills and big pianos' explores the emotive landscape that we call 'life'. 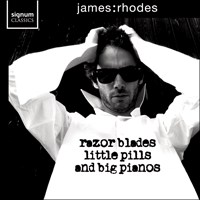 This debut recording is somewhat of a biographical expression of James Rhodes’s complex and unorthodox journey. It was Bach, Beethoven and Chopin; not Faith Hope and Charity, that offered him comfort. I first met James Rhodes at a Queen Elizabeth Hall recital by Grigory Sokolov, one of the world’s great pianists. Publicity-shy and refusing to record, (virtually all of his few discs are of ‘live’ performances and even these are released grudgingly) Sokolov, not surprisingly, is little known outside professional music circles. I was introduced to James during the intermission, an encounter both hilarious and bizarre. To be frank my instinct was to steer clear. Playfully bragging James threatened a possible visit, ‘to see whether you make a decent cup of coffee’, a code phrase, it turned out, for wishing to play for me. Startled and amused I still felt unable to respond, like Mae West, with a ‘come up and see me some time’. James’s ‘I know all about you’ was a familiar phrase usually uttered by people who know nothing about me. The rest was silence. Then came a telephone call and a performance of Beethoven’s ‘Waldstein’ Sonata. The talent (that most unmistakable if elusive of musical virtues) was there, albeit raw and unfocused. We worked for an intensive couple of hours. But unlike other more shamelessly egotistical visitors anxious only for praise (‘you have inherited the mantle of Horowitz’ etc) and who, subject to critical scrutiny vanish as rapidly as they appear, James asked to return the following week. The ‘Waldstein’ was subsequently revisited now polished and transformed. Duly astonished I found this a totally professional piece of work. Since that time we have worked for roughly two years, and a recital given in my flat (Beethoven’s ‘Waldstein’, Chopin’s B major Nocturne opus 62, F minor Fantasie and the opus 25 Etudes Nos 11 and 12, followed as encores by the finale of the B minor Sonata and the Mozart-Volodos Turkish Rondo) suggested a born public performer, a triumphant affirmation for both of us. Later James met Denis Blais who, willing to offer every possible support, suggested an album. I was about to leave for an annual teaching stint at The Conservatoire for Young Artists in Texas, a doubly difficult assignment since David Grice, one of the directors and a dear friend of many years, had recently died leaving an intolerable void in too many people’s lives, I needed time to think and prepare. But James’ insistence that I attend the recording sessions at Potton Hall in deepest rural Suffolk proved hard to counter. For many pianists recording is a frustrating and laborious process loved by some and hated by others (Schnabel made despairing references to ‘the Abbey Road torture chamber’ while Myra Hess found making records ‘like listening to my own funeral’). But James took to the medium like a duck to water. Even his first takes were of an exceptional beauty and commitment. Here, surely, was a resolution of past difficulties, of fraught and damaging circumstances, of put-downs from college ‘professors’ who should have known better. All these performances were uninhibited by simple-minded notions of correctness and the sort of playing that all too often wins college prizes and international competitions, playing as lasting as an imprint on water. The nurturing of such talent is a major responsibility, and as what James describes as his ‘mentor’ I feel privileged to share with him what will surely be a life-long journey and spiritual quest. I can only end by wishing him all the luck—most essential of ingredients—in the world, and the success his playing so clearly deserves. This inclusive recital dips into James’s extensive repertoire and was chosen to show him as a versatile and enriching artist. Beethoven and Chopin framed by Bach and Bach- Busoni together with two vividly contrasted encores creates the widest sense of scope and style, with Bach providing an overall arch and unifying factor. Bach, together with Mozart, was after all among Chopin’s greatest loves. James’s programme commences with Bach pure and simple, the Fifth French Suite with its radiant affirmation of intimacy (the Sarabande and Loure) and joy (the concluding Gigue where Bach is every inch the celebrated virtuoso). This is followed by Beethoven’s E minor Sonata, opus 90 which the late and ever to be lamented Denis Matthews described as greatness inspired by mundane circumstances. The first movement suggests the Count Moritz von Lichnowsky’s struggle between heart and head when about to marry a lady below his social station, while the second movement’s lyrical outpouring resolves all such unease. And, as Denis Matthews puts it, Mendelssohn himself would have been proud to have claimed such concluding serenity among his own ‘Songs without Words’. Next comes Chopin’s Fourth Ballade which, together with the Barcarolle, Polonaise-Fantasie and the Second and Third Sonatas represents the summit of Chopin’s art. The halting start has been described as ‘bringing the same sense of wonder that a blind person, if granted the gift of sight, might feel on discovering the world’s beauty for the first time’. The highly Slavonic principle theme’s return twice bejewelled and the final build up to the pianissimo chords announcing a coda of whirlwind savagery are two of many wonders in this miraculous work. The programme then concludes with romantically hyphenated Bach, with Busoni’s massive elaboration of the Chaconne from the D minor Partita for solo violin. Twenty-nine variations on an eight bar theme, the Bach-Busoni Chaconne can be considered a virtually new work so completely and idiosyncratically does Busoni exploit the modern piano making it the most opulent and truest king of instruments. For encores, a lightening of all possible darkness with Moszkowski’s Etincelles, most scintillating and delectable of show pieces. This is then followed by a return to hyphenated Bach, to the Bach-Siloti B minor Prelude, a work beloved by the great Russian pianist Emil Gilels who invariably offered this exquisite recreation to his audience as a profoundly moving and valedictory gesture.